Along with sun-drenched beaches, Kos offers visitors some wonderful sightseeing opportunities. History buffs will enjoy a day trip to Patmos, the dramatically beautiful island where John the Apostle wrote the Book of Revelations. The sacred healing temple of Asclepieion is another must-see. Located south of Kos Town, it's reputedly where the physician Hippocrates taught his students. Agia Irini's hot sulphur springs and Agios Fokos' hot sea water pools are also worth visiting for a therapeutic dip. Visitors could also stroll around the old harbour area opposite Dolphins Square. The area is home to Knights Castle, which is one of Kos Town's most famous attractions. The ruins are exciting and extensive. 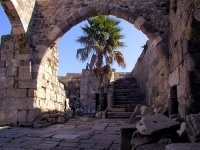 Visitors may also enjoy the Hellenistic Temple's ruins in the old harbour locale. Ancient Greeks dedicated it to Hercules. The Archaeological Museum in the Plateia Eleftherias will captivate visitors' imaginations as well. Otherwise, Kos has some of the best beaches in Greece, where the warm Aegean Sea is perfect for jet skiing, parasailing or relaxing in banana boats. Hikers will relish Dikaios Mountain.